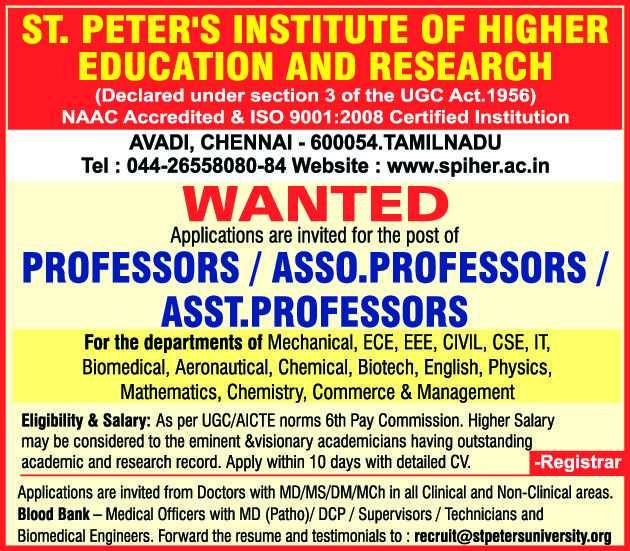 St.Peter's Institute of Higher Education and Research, Chennai has advertised in THE HINDU newspaper for recruitment of Teaching Faculty- Professor / Associate Professor / Assistant Professor Plus Non-Faculty jobs vacancies. Interested and eligible job aspirants are requested to apply within 10 days from 20th March 2019. Check out further more details below. About College : St. Peter’s Institute of Higher Education and Research is a Deemed to be University declared U/S 3 of UGC Act, 1956 since 2008. The institution was previously known as St.Peter’s Engineering College which was established in the year 1993. It is one of the India’s leading Institute, with students all over the country. The institution continuously strives to focus on imparting quality technical education and introducing innovative programmes leading to Research and Development for sustainable growth.